It’s that time of year again. A time for gathering with friends and family, holiday cheer and generosity. In the world of health care one of the most recognizable forms of Christmas charity comes in the form of the Christmas Seals. The idea originated in Copenhagen in 1903. As the story goes, a postman by the name of Einar Holboell was working late one December night sorting the piles of Christmas mail. He happened to look out the window as two homeless children passed by and when he returned to his work Holboell had an idea; what if people could buy extra stamps for their mail and the proceeds would go to charity? The following Christmas, after designing the seals, Holboell and his coworkers sold four million stickers to the Danes. 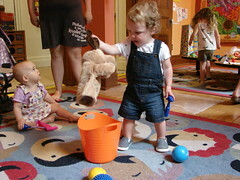 The question became which children to aid. They decided to donate the proceeds to aid the countless children affected by tuberculosis, beginning the construction of two hospitals which would treat the children. Tuberculosis is caused by a bacterial infection of Mycobacterium tuberculosis, a bacteria usually acquired through the inhalation of air-borne droplets or dried particulates of phlegm. After inhaling the bacteria, any that survive the immune system become dormant inside tubercles, leading to the development of the active disease state anywhere from soon after the infection to many years later. Tuberculosis is spread when individuals with the active disease exhale the bacteria, but to be at risk, a healthy individual would have to spend several hours a day with the affected person. However, cramped living conditions, high population densities and compromised immune systems all contribute to an increased susceptibility and likelihood of transmission. Historically, the cramped conditions and low wages of the Industrial Revolution led to a rise in the incidence of TB in the late 18th and early 19th centuries. In Canada, tuberculosis was the leading cause of death in 1867. In 1882, Robert Koch discovered that the disease was caused by bacteria, convincing the public and medical practitioners that the disease was contagious. Preventing the spread of TB became the focus of subsequent public health initiatives. In addition to public awareness, there were few treatments for TB before the advent of antibiotics. The two main methods included collapsing the affected lung to allow the bacteria to die and the lung’s repair, as well as time spent in a sanatorium. Sanatoria were hospitals designed to provide treatment to tuberculosis patients. 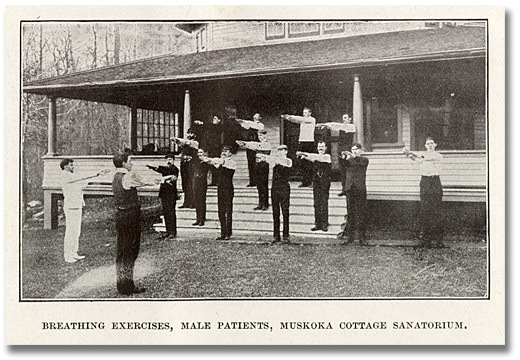 Exercise in the fresh air as part of the treatment program at the Muskoka Cottage Sanatorium. Their treatment included bed rest, fresh air and regulated diets. Canada built its first sanatorium, the Muskoka Cottage Sanatorium, in 1897. 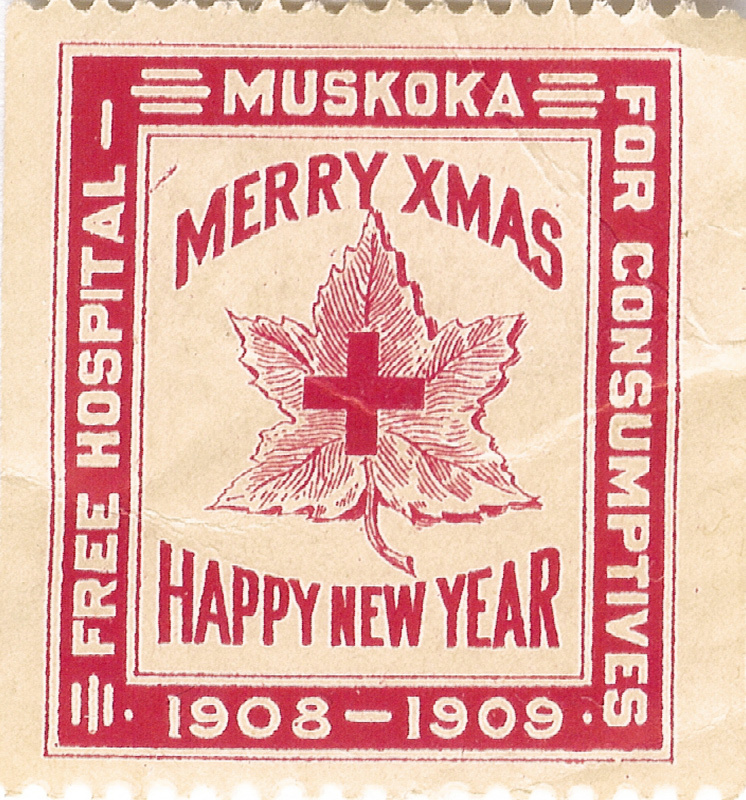 By 1934, Ontario had twelve sanatoria including the Muskoka Free Hospital for Consumptives, the world’s first free tuberculosis hospital. In addition to local sanatoria in the Kingston area, the Kingston General Hospital also contained a tuberculosis ward for several years. Following in the footsteps of Denmark, Canada began issuing Christmas seals to support its sanatoria. In 1908 the first Canadian Christmas Seals were issued in Toronto, Hamilton and Winnipeg by the National Sanitarium Association and by the Canadian Association for the Prevention of Consumption and other forms of Tuberculosis. 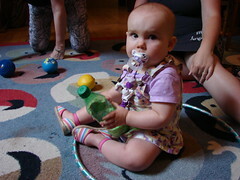 The seals were sold to raise funds for local sanatoria. After the first issue other cities across Canada joined the campaign. The annual Christmas Seal initiative became not only a means of raising money but an outlet to spread tuberculosis awareness across the country, especially that it could be controlled. 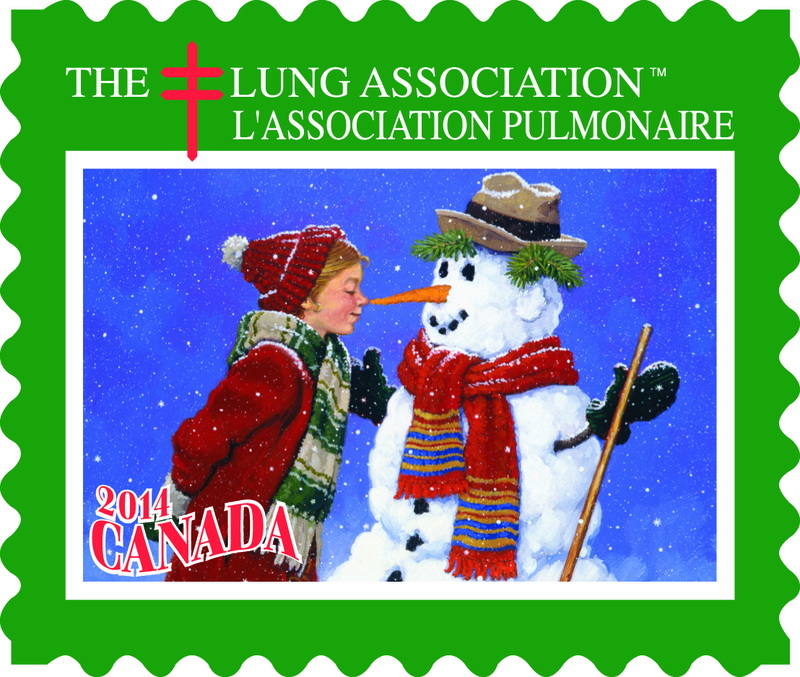 In 1928 the renamed Canadian Tuberculosis Association issued the first national Christmas Seal campaign. While examining the Museum’s collection of Christmas Seals what struck me as being the most interesting about the seals was not their history, but the variety of advertising techniques they employed to spread awareness and to promote sales. Even Holboell’s very first seal used the age-old technique of celebrity endorsement. After developing their idea, the postmen approached King Christian IX. The king was enthusiastic about their plan and suggested they place a picture of the queen on their stamp as a symbol of endorsement. Thus the first Christmas Seal has a picture of Queen Louise, an addition that no doubt added to the popularity of the stamp and boosted sales. Canada’s Christmas Seals also employed a variety of advertising techniques. Early on, there was an emphasis on shapes. Some, like the 1908 Muskoka seal take the form of a faux stamp. Others such as the series from 1923 take on the form of round stickers. Later, a standardized stamp format was adopted, often with the date and Canada written upon it. Another component that evolved is the packaging of the seals. Early on they were sold in packages of ten stamps, later changing to one hundred stamp packages and sheets. These changes illustrate not only the artist’s thoughts for the year’s design, but the attempt to appeal to the public in an effort to boost sales. The seals illustrate a mixture of imagery and designs. Canada’s seals included religious imagery such as angels and nativity scenes and secular imagery such as Santa Claus. Some years every seal in a package would have the same imagery, while others would have a variety of different images in a single package. Sometimes the overall sheet would illustrate a design in addition to that on the individual seal. 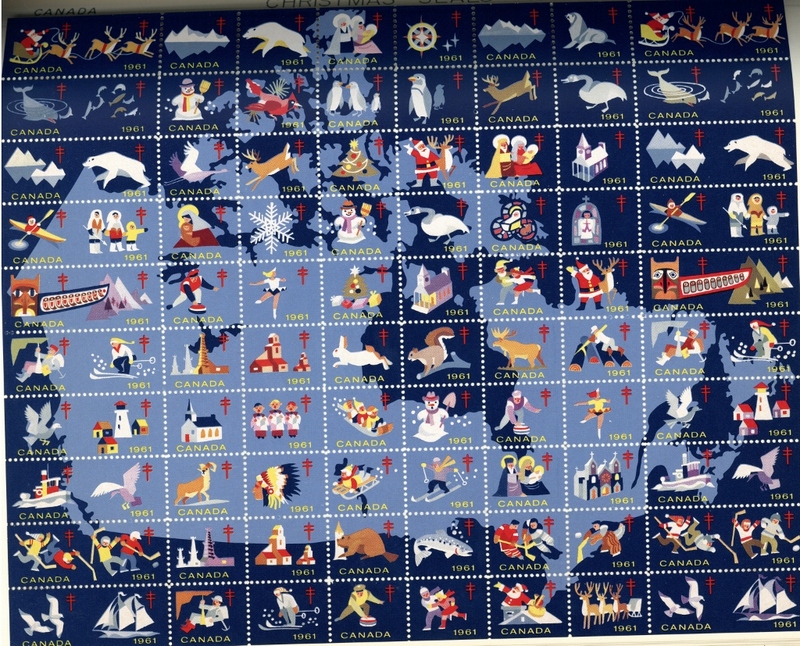 On the 1961 sheet individual stamps show a variety of images including hockey players, animals, and the nativity, but overall, underlying the image, the entire sheet contains a map of Canada. A similar technique is shown by the 1963 sheet. At first glance the design of the sheet is not apparent. The seals depict a variety of images, some without any connection to Christmas. Upon closer inspection, one can make out the chain links between images on individual stamps, the wheels on the stamps and the small children watching the images roll by. It’s a parade! These interesting designs added to the appeal of the stamps, increasing sales and raising awareness about tuberculosis. From 1922 – 1926 the initiative used a different tactic to boost sales. 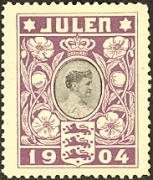 Notable is the absence of the characteristic double barred cross from these stamps. The cross was the worldwide symbol for tuberculosis. The reason is explained in a piece of correspondence between an avid collecting doctor and the business manager of the National Sanitarium Association, G.A. Reid. When referring to the absence of the cross Reid writes, “Looking back over the years I now regret this but it was brought about owing to pressure from certain sources for seals without any identification marks in order that they might more readily be sold.” It is quite interesting to see the measures the campaign was willing to use in order to boost their fundraising numbers. It seems they thought more people would buy the stamp without the cross; perhaps more people would have more use for a plain Christmas sticker. However this detracts from the second goal of the initiative, to spread awareness of tuberculosis. Likely the cost outweighed the benefit leading to the renewal of the cross. With the introduction of antibiotics and the decline in tuberculosis cases in the 1960s, the 1967 seal slogan reads “Fight tuberculosis and other respiratory diseases- Use Christmas seals.” The Canadian Tuberculosis Association began work on other respiratory disease and renamed itself the Canadian Lung Association to reflect this change. Today the seals support the battle against lung cancer, asthma, chronic obstructive pulmonary disease, smoking and air pollution. The seals are no longer sold to collect funds although you may make a donation to the program after registering to receive your seals. To learn more about tuberculosis visit the Museum of Health Care’s online exhibit: FIGHTING FOR BREATH: Stopping the TB Epidemic. 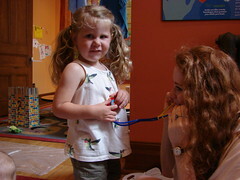 Museum of Health Care. 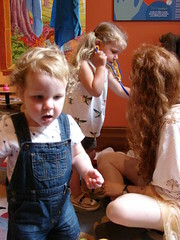 “Fighting for Breath: Stopping the TB Epidemic.” Accessed December 2014. http://museumofhealthcare.ca/explore/exhibits/breath/resources.html.